Dogs are warm and affectionate, but you do not want your dog breathing on you when he has bad breath. Whether he is curled up next to you or excited to see you after you have been away, it is likely that you will notice your dog’s bad breath if he is nearby. Fortunately, there are simple steps that can help you keep his breath smelling fresh and clean. Many dogs love chewing raw bones. The bones reduce tarter and help maintain a fresh scent in your dog’s mouth. Keep in mind that cooked bones can dangerous for your dog to chew because they are more likely to break off in your dog’s mouth. Another way you can help your dog maintain fresh breath is to brush his teeth. When you first start brushing your dog’s teeth, let him get used to the process by using your finger to apply a little dog toothpaste to his teeth. Do not worry about cleaning every tooth. Instead, get your dog comfortable with the process and praise him. Over time, introduce a toothbrush and extend the brushing time until you clean all his teeth. You can also use a mixture of baking soda and water to help your dog’s teeth stay clean and smell fresh. In addition, dog toys can help improve your dog’s breath. Look for dog toys that have scents that can help eliminate breath odor. A scent that attracts your dog will encourage him to chew longer. Essenti pet toys are durable, washable and have a pleasant scent that dogs like. Our scented toys will let your dog enjoy himself while his breath improves. Order some of our many scented dog toys today and help your dog’s breath smell fresh. 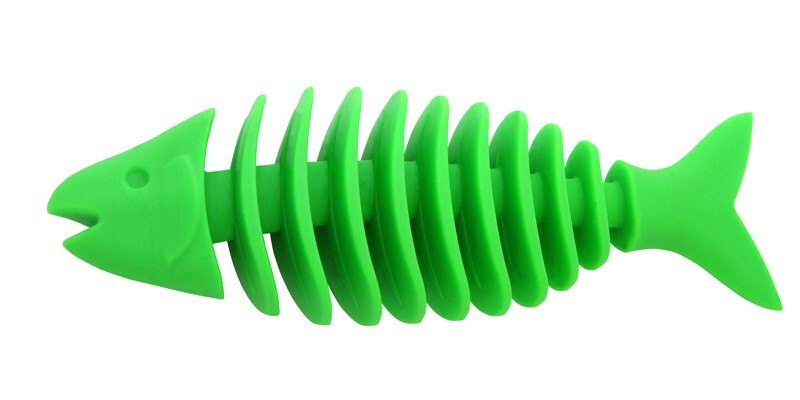 Our eco-friendly dental dog toys are extremely valuable to your dog’s breath and health. Although many types of table food are not safe for dogs, pets often beg for food. Interestingly enough, research conducted by a University of Florida research team suggests that dogs may decide whether to beg based on the physical actions of the person eating. When dogs were exposed to people who faced them versus people whose faces were hidden from view, they were more likely to beg from people facing them. The study was conducted with wolves, stray dogs and pets. Pet dogs seemed to be able to interpret the behavior of the subjects better than strays and wolves, presumably because they had experience living with humans. However, even if your dog is experienced at interpreting your behavior, there are steps you can take to minimize begging. If your dog attempts to beg, avoid looking at him. You will be sending a message that you may succumb and give him food. Above all, do not give your dog table food. You will be reinforcing his behavior, and encouraging begging. Keep in mind that when you are making dinner and eating, your dog is drawn to the scent of your food. You can prevent him from approaching the table by barring his access. Either set up a gate or put him in a room or crate that limits his ability to approach the table. Another possibility that will keep your dog from begging is to distract him. Give your dog toys to chew and entertain him. You could also provide your dog with his meal while you are eating. If your dog is satisfied, he is less likely to be interested in your food. Essenti Enterprises, LLC has a line of scented toys that can keep your busy and happy while you eat. Additionally, if you want to feed your dog while you are eating, encourage your dog to eat by putting his food in his dog dish. Position the dish so it is away from your own eating area. Essenti dog dishes are durable and stable, so they stay in one place making it easy for your dog to enjoy his meal without becoming frustrated. Order our pet products, and let them help you keep your dog away from your own dining table.